William Watson was born on 21 October 1863 at Campbell Creek near Castlemaine in Victoria. He was the first son of Scottish-born William Watson, a quartz miner, and Matilda Watson (nee Spiers) who was born in London, UK. Watson was educated at Guildford Public School but from the age of thirteen worked at a variety of labouring and commercial jobs before learning the basics of the pork industry while employed in a rural general store. In 1888 he married his wife Eliza at Castlemaine and opened a grocery store in Melbourne in the following year. He moved with his family to Fremantle in 1895 where he operated various stores and tea room as well as constructing a pork abattoir and bacon and sausage factory at Hamilton Hill. Commencing in 1918 he changed the emphasis of his business from retailing to manufacturing and wholesaling of small goods developing the brand name Watsonia. In 1914 and again in 1921 he contested the Legislative Assembly seat of South Fremantle on behalf of the Liberal and Nationalist parties but in the interim he ran as an Independent for the federal seat of Swan in the 1918 by election following the death of John Forrest. Watson's Luncheon Rooms on the corner of High and Mouat Streets, Fremantle, 1907/1914. Courtesy Fremantle City Library Local History Collection: Photo No. 2696. Watson commenced his federal parliamentary career in 1922 when he won Fremantle as an Independent defeating the Labor candidate J B Holman (father of May Holman) by 2500 votes on the preferences of the endorsed Nationalist and former member William Hedges. In 1925 Watson retained the seat, defeating John Curtin by nearly 6000 votes in a straight out contest, but he was not a candidate when Curtin was successful both in 1928 and 1929. Apparently prompted by concern over the economic crisis Watson contested the 1931 election for Fremantle as an endorsed United Australia Party candidate and defeated Curtin by 5000 votes on the preferences of secessionist and future State MP H K Watson who had been the endorsed Nationalist candidate in 1929. 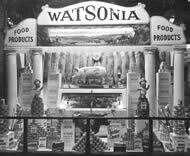 Display of Watson's products at the Perth Royal Show. Courtesy Fremantle City Library Local History Collection: Photo No. 898. With his health deteriorating Watson did not contest the 1934 election when Curtin regained the seat and three years later he handed over the directorship of the family business to his sons. A life member of both the Returned Services League and the Spearwood Fruit growers and Market Gardeners Association he died at Peppermint Grove on 21 December 1938 survived by his wife, three sons and three daughters. Curtin was a pallbearer at Watson's funeral describing him as a 'generous and friendly opponent'. In 2006 the Watsonia brand name was still being used by the Canadian firm George Weston Foods Pty Ltd to market its small goods and dairy products. 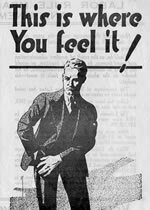 'This is where you'll feel it - Labor rule means extravagance and unemployment', UAP advertisement for the 1925 federal election.